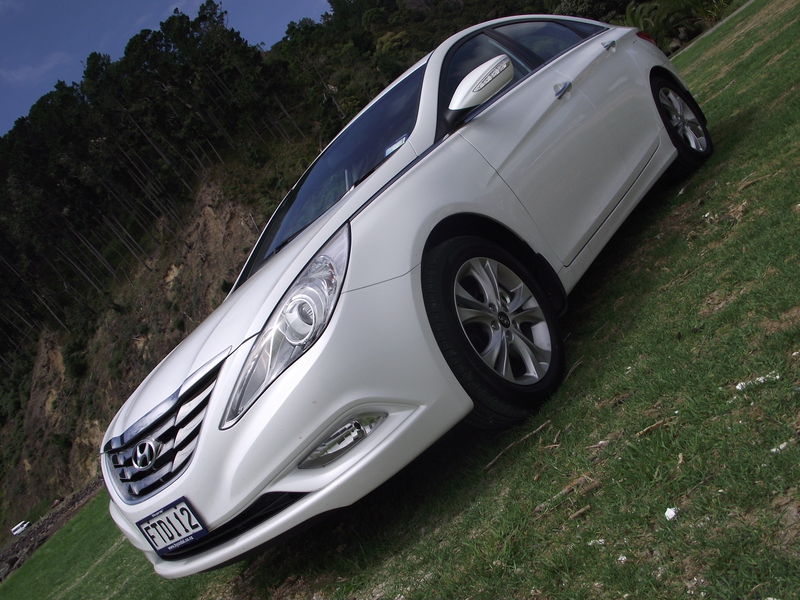 It all started in 1985 when Hyundai released the Sonata. It was a revamped version of the Stellar that actually wasn’t all that stellar. The Sonata was certainly nothing to write home about either, also pretty much every Sonata after that. 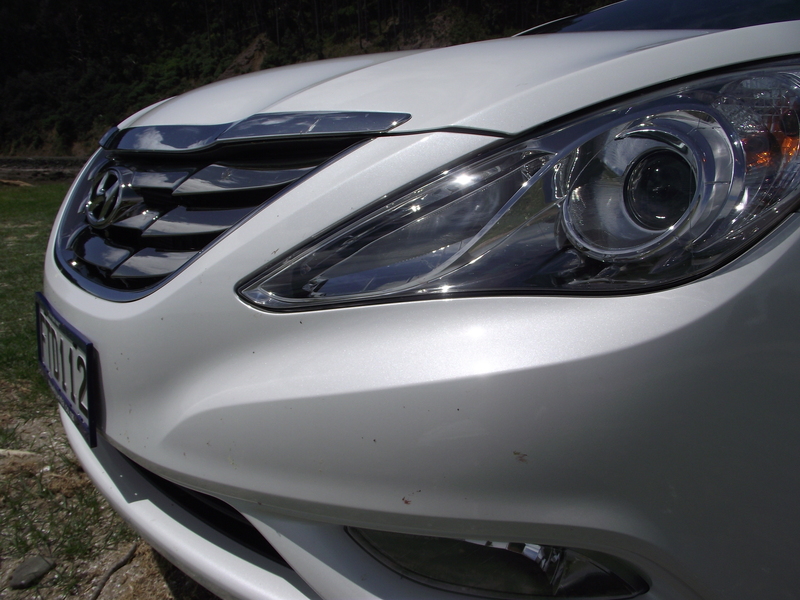 Not to mention other models in the Hyundai range: Pony, Excel, Accent, Elantra and so on. Not that they were ever unreliable in fact they appear to be very reliable indeed hence you still see many of them on our roads daily, unexcitingly meandering along taking their occupants from point A to point B. These ‘80’s and ‘90’s Hyundai’s were bland, boring and very unsafe should their occupants be unfortunate enough to have an altercation with one of the many drivers on our roads that can’t, um, drive. 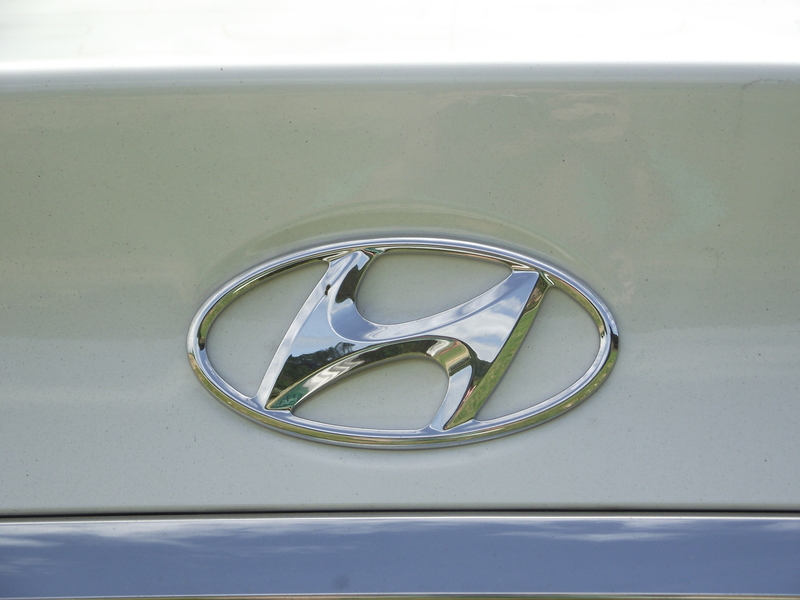 As time moved on Hyundai seemed to move on, they have learnt from their mistakes and evolved into a quality car maker that is challenging, and overtaking, some of the biggest names in the business and now are sitting fifth top world wide seller, that’s fifth only to Toyota, GM, Renault-Nissan and VW Audi Group. A world away from where they were 10 years ago. 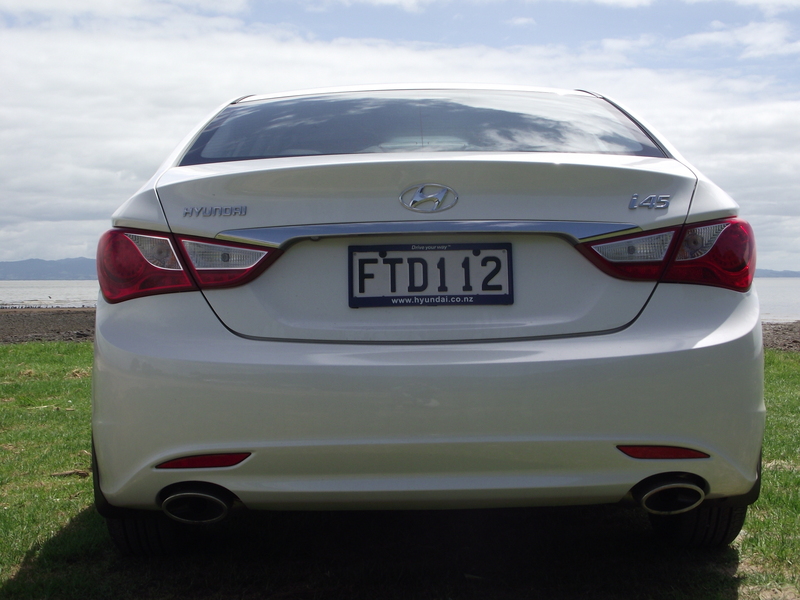 I was fortunate enough in the last week to drive one of the cars that is helping the South Korean car manufacturer take on the big wigs of the automotive world: the Hyundai i45 A6 2.4. There was a little confusion when picking the car up as when getting in I noticed it didn’t have the Elite options even though the registration label stated that it was the i45 A6 2.4 Elite. 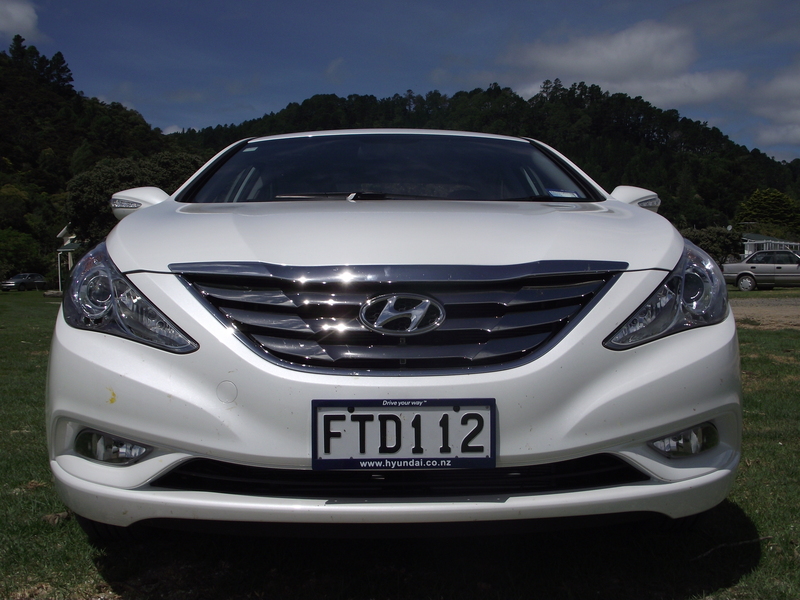 After an enquiry with Hyundai HQ quarters it was revealed that the vehicle model code is set up in Korea like this, and is unable to be changed here in New Zealand. Okay, fair enough. But this would be extremely confusing for anyone buying one second-hand a few years down the track. Right, now, down to my drive. 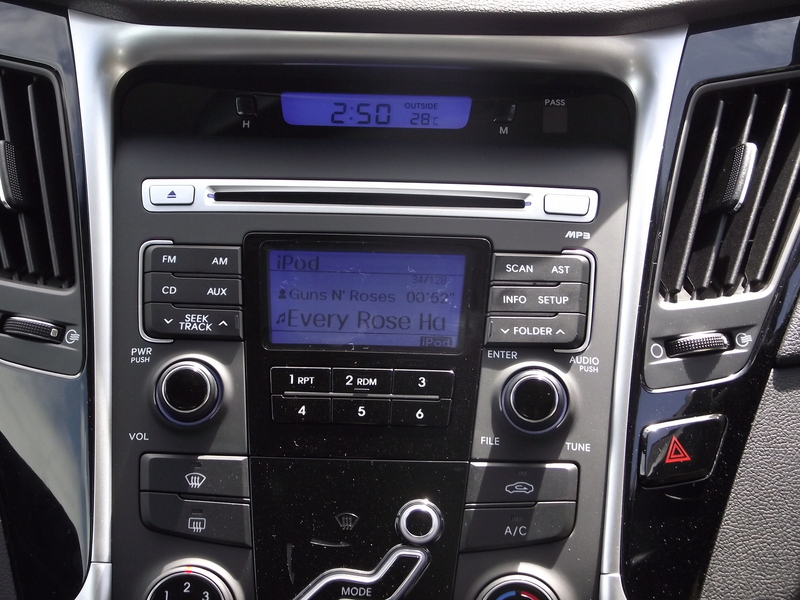 I was driving the Hyundai i45 A6 2.4 (non-elite). Before picking this car up the only images of Hyundai popping into my head were of those previous ugly uncomfortable lumps of blandness that you see around, like the Excel Sport Coupe (Sport? Really?) in my neighbours driveway. 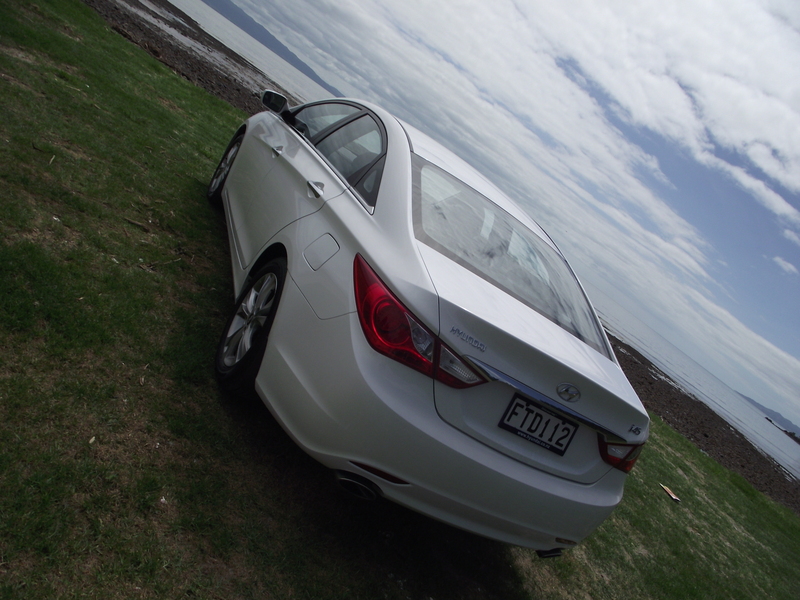 The 5th generation Sonata is a very good car but it’s styling is nothing that will knock your socks off. 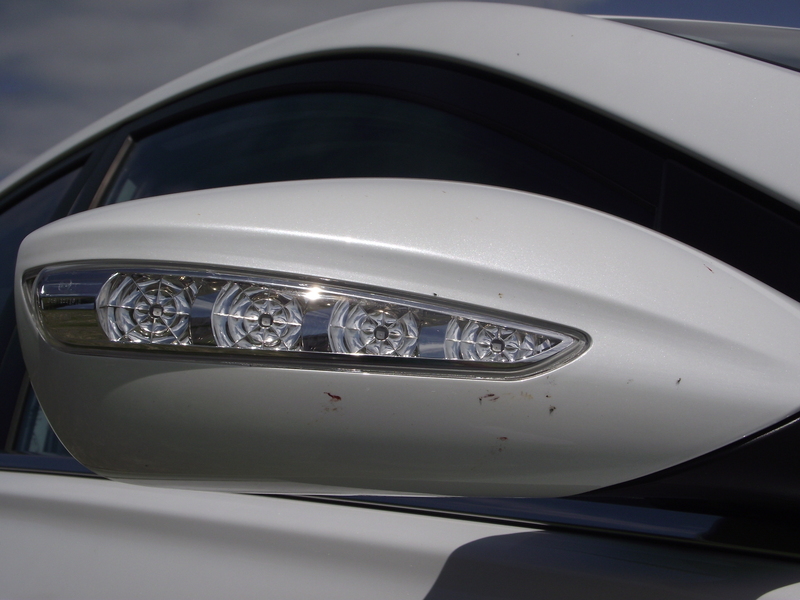 However what they have achieved with the i45 (badged as Sonata in other markets) is something special. From every angle this car is eye watering beauty, from the sweeping waist line, the shiny grill, which may take some people time to get used to, and the aerodynamic side mirrors to the sculptured tail lights, chrome tipped exhausts and the chrome strip running from the headlights to the rear quarter glass there is not one millimetre that has been over looked by the design team. Far from Korea in Hyundai’s California design studio Andre Hudson penned this car on what they call ‘Fluid Sculpture’ which they have taken from nature. It seems to have worked. Almost as though they have taken a big lump of sandstone, made the centre roughly the shape they wanted, and hit it with a water blaster. 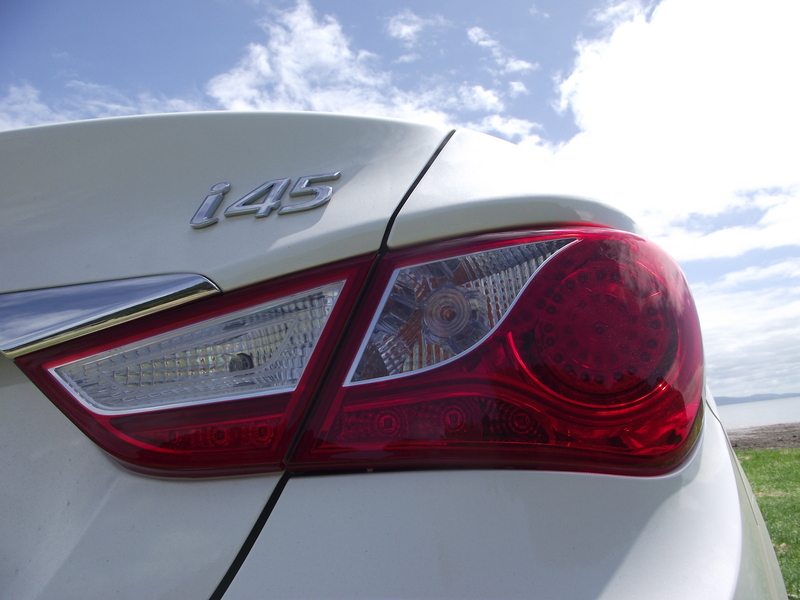 The smooth lines make you fall in love immediately, the i45 turns heads wherever you go. These smooth lines and stunning attention to detail and quality continues on the inside of the car. Every button and dial fall to hand naturally, are easy to use, and are of the best solid quality usually only found in top European cars three times the price. 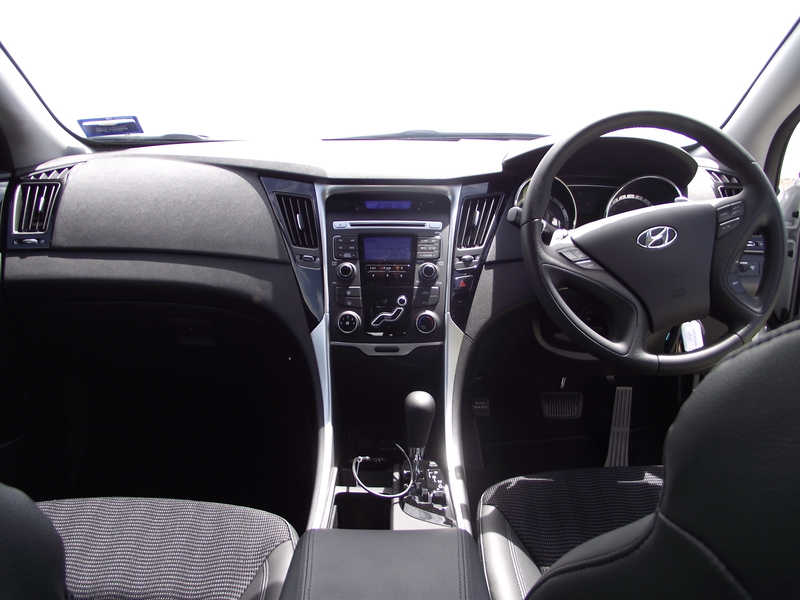 This is one of the most practical and comfortable interiors to spend kilometre after kilometre in. You won’t even mind being stuck in the bumper to bumper traffic on Auckland’s Southern Motorway, in fact, when you do get home you’ll only want to keep driving. On a trip to Thames tagging along for the ride was the mother-in-law and her 92 year young mother in the back seat along with their grand-daughter and accompanying car seat. Amazingly even with the mother-in-laws dodgy hip she never complained once about being uncomfortable. Very amazing, a mother-in-law not complaining! 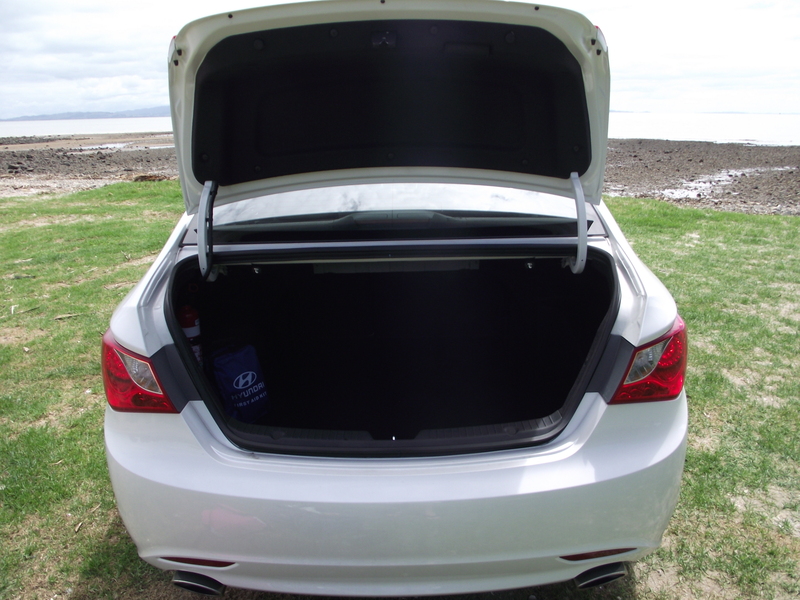 Then there’s the boot, they both fit in there very well, with room to spare. That’s their walking frames by the way. Look at the mechanics of this beauty and the quality doesn’t end with the interior. When you start the i45 you will wonder if the engine is actually running it’s just so smooth yet when you plant your hoof on the go pedal the 2.4 litre 148kW and 250Nm four cylinder GDi will take off like a cat whose tail found itself under a work boot, with a great resonance that’ll put a smile on your dial. It can be a little sluggish in the lower rev range though. But when those revs push past 4000 and the noise, oh the noise, best sounding four cylinder engine I’ve heard in a very long time. 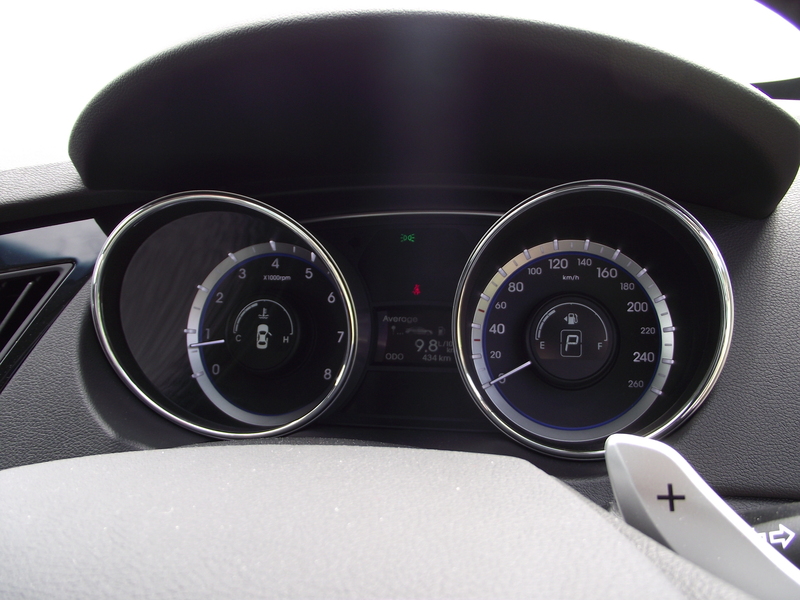 Given the bad wrap paddle shift gear change systems have had and the pretty rubbish ones I’ve driven it was surprising to find that the Hyundai i45’s 6 speed tiptronic paddle shifter worked very well indeed. The only issue with it was, when trying to push a little further through the higher revs it had a tendency to change up for you. The irritating thing there was the massive computer brain would do that just a fraction of a second before I flicked the + paddle therefore putting it in a gear higher that expected, which kind of ruined the fun of flicking this stunner through a tight bend. Once you get used to changing up before the silicon chip does, what appears on the outside to be a family sedan will feel like a race car and have you getting out with a grin bigger than Steven Tylers’. The steering is pleasantly easy at low speeds which makes parking a doddle and also allows for the tightest turning circle I have ever seen in a front wheel drive car of this size. After driving the i45 for a few days I found myself saying something I never thought I’d say about a Hyundai… I want one. They are surprisingly affordable for the quality you get: The entry level i45 2.0 A6 starts at $42.990, my press car was the i45 2.4 A6 at $45,490. The i45 2.4 A6 Elite is at $49.990 which adds a whole heap more kit like heated full leather seats, reversing sensors, climate air, rain sensing wipers, and a proximity key. The i45 2.4 A6 Elite is $52.990 and adds a panoramic sunroof. Vice Chairman ES Chung said at the Detroit Motor Show that Hyundai has a new brand called ‘Modern Premium’. They are realising that “Shifting market dynamics and customer needs are changing the meaning of `premium’”. He also said “Hyundai is not just a company that makes cars. 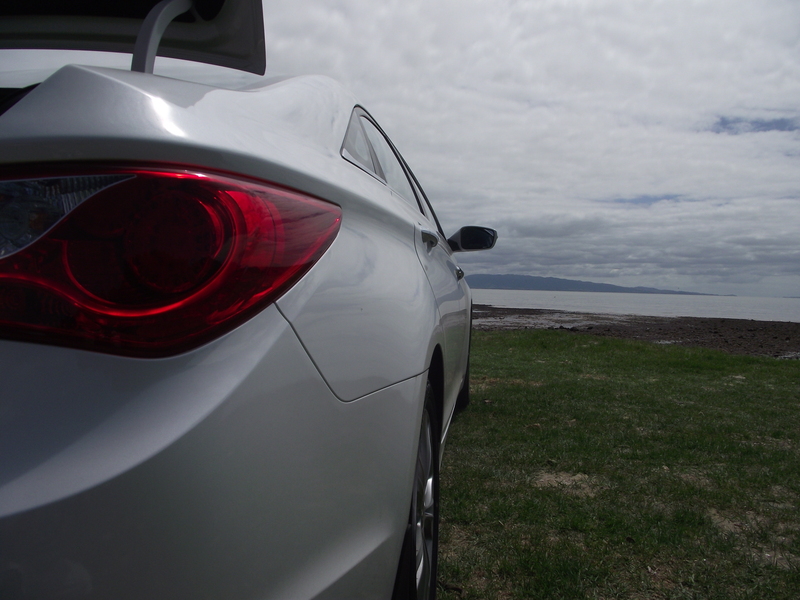 Hyundai is a company that creates new possibilities. Our goal is not to be the biggest car company. Our goal is to be the most loved automotive company on the planet, and to be a trusted lifetime partner of our owners”. If they continue making cars like this, their goal will be achieved. I was wondering how long it would take before someone noticed, a month isnt bad I guess! GNR didnt do Every Rose..., it was Poison.